About | Browns Antiques Billiards and Interiors. At Brown’s Antiques, Billiards and Interiors, we specialise in antique snooker tables and billiards tables, and snooker accessories, as well as general antique furniture. We love what we do and think you will too. Stock We stock a range of antique snooker and billiards tables in sizes from 6ft to full size, including antique snooker dining tables, and rollover snooker tables. Our stock is added to regularly. Our antique furniture stock includes a variety of antique dining tables, including refectory tables, and sets of antique dining chairs, as well as general antique furniture, and some architectural antiques. Prices We have many years’ experience in antique furniture and antique snooker tables. We keep our overheads as low as possible, in order to keep our prices keen. We are antiques enthusiasts, and do not stock new, reproduction, or modern items. Restoration All restoration is carefully carried out by hand. We use traditional French polishing techniques, and sympathetically restore each piece. We only replace parts if absolutely necessary. We use natural products , and the best quality materials. We never spray finish. We are an environmentally friendly company, and are delighted to have been awarded a Green Apple Environment Award in 2011. Our customers We sell to the general public and trade, and provide antique furniture and snooker tables to interior designers and for shop display. We are passionate about what we do, and like to involve the customer as much as possible. We believe that excellent customer service makes all the difference. For example, when you buy an antique snooker table from us, you can expect to be fully involved in every stage of the restoration process, as we will consult with you and ask your opinion as we restore the table to your requirements. Antique Snooker Tables at Brown’s Antiques Billiards and Interiors. We stock antique snooker tables , billiards tables and pool tables. We do not stock modern tables. We have a range of sizes of snooker tables for sale, from 6ft tables to full size (12ft) tables. We specialise in antique snooker diners/antique snooker dining tables, which we stock in sizes 6ft, 7ft, 8ft and 9ft. We have many years’ experience in restoring antique snooker tables and billiards tables for both trade and retail customers, and undertake all restoration ourselves. All our antique snooker tables for sale are sympathetically restored, retaining the character of each individual table. Our French polisher carefully restores the woodwork by hand, using traditional methods, whilst our snooker and billiards technician replaces the bedcloth, re-rubbers and covers the cushions, and replaces pockets and nets. We use 6811 tournament cloth and northern rubber as standard. Any replacement parts are craftsman made locally, we do not use cheap imported parts. We pride ourself on this attention to detail, which cannot be compared with a spray finish. All our antique snooker tables come with a free ‘starter kit’ consisting of new or good quality used cues, balls, triangle, chalk and rules. We also stock a wide range of antique snooker and billiards accessories, which includes antique snooker scoreboards, life pool marker boards, antique snooker cue racks, as well as antique snooker and billiards prints and advertisements. 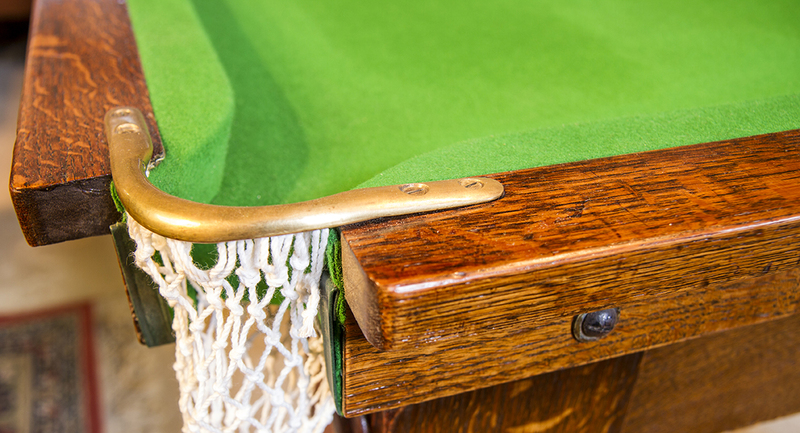 If you have an antique snooker table, pool or billiards table that needs restoration, we will be delighted to provide a quote for re-polishing and restoring your table. For more details of our repolishing and restoration service, please see our Restoration page. 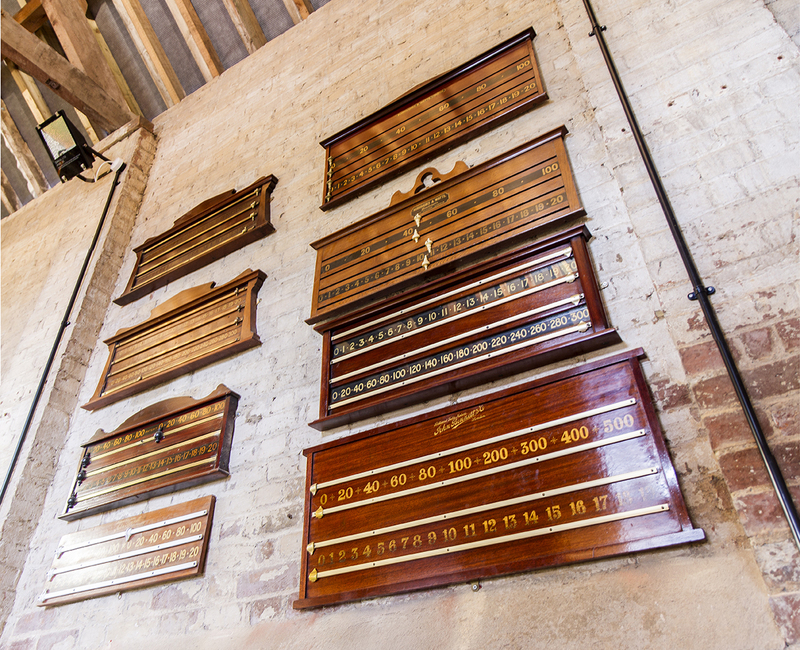 We have a selection of antique snooker tables and billiards tables that can be hired. Please see our Snooker Table Hire page for more details. This service has proved popular for weddings, as well as for retail and shop display purposes. Tables can be hired for a day, or for longer periods. We stock a range of antique furniture and tend to specialise in large / long antique dining tables and sets of chairs. Stock also includes antique armoires and other storage furniture such as cupboards and chests of drawers. We can also provide more unusual items such as antique shop fittings, overmantle mirrors and architectural antiques. Please ask us if there is something specific that you are looking for. We provide a ‘finding’ service, where we will source the items of antique furniture that you are looking for. Contact us with details of the item you are looking for and we will endeavour to find it. There is no charge for this sourcing service. Read about antique furniture sourcing here. If you have antique furniture that you would like restored, please contact us, and our French polishing team will be pleased to provide a quote. 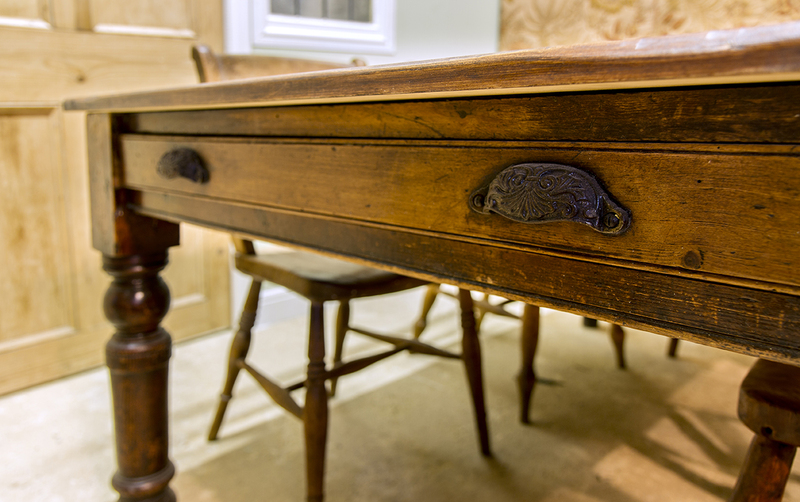 Our French polishers use traditional methods to sympathetically restore antique furniture and antique snooker tables. Please see our Restoration page for further details. In August 2017, we were delighted to be chosen as one of Theo Paphitis’ #SBS winners. We won an International CSR Excellence Award two years in a row: 2014 and 2015. Please click to Read about Brown’s awards here.